Microsoft's on-demand IoT In Action Virtual Bootcamp provides a deep look into the modern IoT world in the virtual equivalent of two short days. Once integrators complete it, they'll have a good foundation for viewing the industry-focused and Windows-specific IoT webinars Microsoft offers on its IoT in Action Webinar page, including the three Business Transformation Webinars that will be offered live the second week of May, 2019. I have some small quibbles but came away largely impressed by the tools that Microsoft has put together to help integrators and ISVs create custom solutions for customers. And with help of partners like co-sponsor Arrow Electronics, a custom project for one client can easily become a general product for a wide range of customers. One lesson learned: The Internet of Things isn't about “things,” it's about how those things help you provide business services that were impractical or impossible just a few years ago. IoT is no longer about the networked devices, it's about improving business processes. That means software. 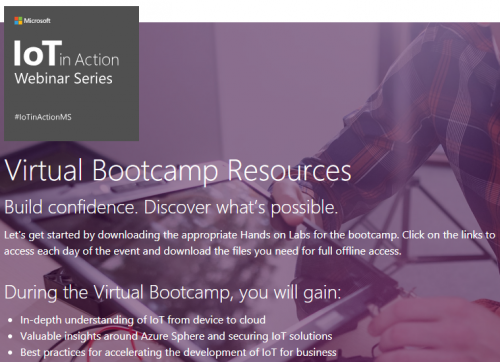 Since the Virtual Bootcamp was hands on, you'll want to purchase the small amount of hardware required in advance from Arrow, as well Microsoft's Visual Studio Code product and the various Azure IoT service programs you'll need. There's no cost to sign up, but doing so beforehand could reduce the stress and scramble to get rolling during the bootcamp. The lessons imparted during the bootcamp, including the range of Azure IoT services available to make developing a custom IoT product, were impressive. Developing any product will be complicated, but the "Microsoft is simplifying IoT" message resonated strongly. Azure IoT Central is a portal to a wide range of IoT solutions. Many common IoT tasks, like monitoring and predictive maintenance, have already been programmed as an Azure IoT Solution Accelerator. Cloud connections and IoT device management are handled by the Azure IoT Hub. Azure IoT Edge allows partners to write code in the cloud and run it on an edge device if desired. Then the Azure cloud will help manage changes, updates, and other product maintenance. IoT and artificial intelligence (AI) go hand in hand, as IoT devices provide the data that AI analyzes. Microsoft Cognitive Services, an area I had not investigated before, easily links in vision, speech, language, knowledge bases, and advanced search capabilities (such as video). One thing is clear: IoT product development demands programmers, but they need not be familiar with specialized IoT devices. Any programmer comfortable in the Microsoft realm, in any one of a wide range of languages, can write IoT product code in this system. The final takeaway? Another major reseller ecosystem change has begun. Break-fix shops added MSP services, while hardware box resellers became comfortable with cloud subscriptions. Those companies embracing IoT today will be the intelligent business process providers of the future. And if you're a Microsoft shop, the tools are in place to support a wide range IoT technologies that will help your customers.